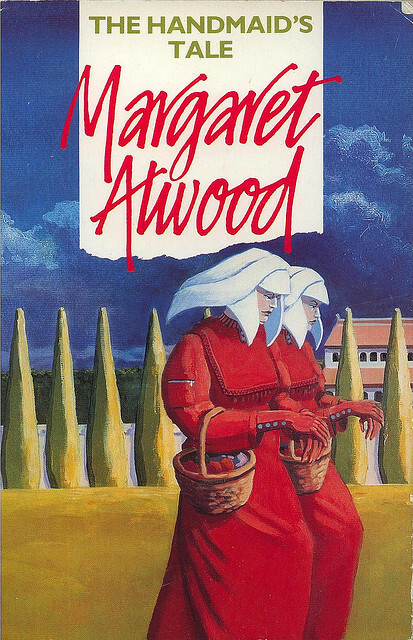 The Handmaid’s Tale is a dystopian story – one about an imagined place that is undesirable – written by Canadian author Margaret Atwood and first published in 1985. Dystopian novels often feature totalitarian governments, and this story is no exception. In the United States of the near future, an extreme Christian theocracy rules. The government seems to be constantly at war, although we don’t directly witness this in the urban setting of the novel. The society’s problems are compounded by the fact that not many people are able to give birth (no kids, no soldiers!). The few women that are fertile are rounded up, indoctrinated to become ‘handmaids’ and given to prominent members of the military dictatorship as reproductive slaves. Being a prominent work of science (or speculative) fiction, The Handmaid’s Tale is an apt choice for an investigation into literature and contexts. Anti-totalitarian dystopian novels flourished in the 20th century, including such famous stories as 1984, Brave New World and Fahrenheit 451. The work gives insight into issues surrounding religion, government and subjugation of women and was written at a time of conservative religious revival, marked by such events as the election of Margaret Thatcher in the UK and Ronald Reagan in the USA. The setting of the novel portrays the antithesis of the feminist sexual revolution of the 1960s and 70s, with males in complete control of women and their sexual lives. In one article Margaret Atwood herself explains that her story is “a study of power, and how it operates and how it deforms or shapes the people who are living within that kind of regime” (Rothstein, 1986). As an example of interesting style, The Handmaid’s Tale provides a plethora of techniques to investigate. The story is told in an unconventional narrative structure, alternating between memories of the past and present. The first-person narrator herself seems somewhat unreliable and speaks mostly in present tense. She often employs a stream of consciousness style that is sometimes dispassionate, factual and resigned in tone. It contains taboo subject matter. Visual imagery and symbols often have allusions to the bible and other dystopian stories. Neologisms (made up words) are frequently used. The list goes on and on! Check out Cliffnotes for some more. I hope we will enjoy reading and discussing this novel together! Check out some of the resources below to help you with your investigation. Sparknotes. This resource provides an in-depth and comprehensive summary of the novel’s context, plot and analysis. It is a useful resource, but try to form your own ideas and opinions about the text before going here. Shmoop. This site is much the same as Sparknotes, but written in a more accessible style. For ideas it is great, but don’t emulate the casual written style in your own essays! Resource folder. All the resources I create I will place into this folder. You can find individual links to documents below. Study Guide. Make a copy of this Google doc for your English folder and use it to investigate the story. I am an ELA Honors12 and AP Lang teacher and have just reviewed your phenomenal materials. Thank you! Thank you for sharing. You have valuable ideas and I am grateful for them. Thank you for sharing this information. This will be the first time I am teaching this text and you r resources have made my unit development so much easier. Thank you so much! It’s very generous of you to share your fab resources. Thank you! Thanks for sharing these resources. Is it OK if I use these as I have not taught the novel before? I would fully acknowledge your authorship of the documents. Yes, of course! Good luck teaching the novel! Thank you for posting these resources! I’m trying to plan my own unit, and I think I have some ideas now! I’ve never taught this before! Wow – I’m teaching The Handmaid’s Tale and just stumbled upon your website. Your ideas are terrific and I thank you for posting them.